My story recommendation of the week goes to Dragon Dreams on Cardboard Wings and Tiny Scraps of Yellow by Christopher Kastensmidt, published November 4, 2010 at Daily Science Fiction. I typically have little use for flash fiction, because it is so difficult for an author to draw the reader into the characters and events of such a short work of fiction. But every so often, an author does draw me into a short-short story, and I can only marvel at his or her skill in pulling it off. Remarkably, Christopher Kastensmidt's "Dragon Dreams on Cardboard Wings and Tiny Scraps of Yellow" tells an absorbing story in under 400 words, barely longer than this blog post. All we learn in that length about the main character is that she is a computer programmer working in a cubicle farm. Yet her yearning to escape her mundane existence strikes a universal chord. Christopher Kastensmidt is an American living in Brazil, who designs video games when he is not writing fiction and poetry. He has co-written a Little Red Riding Hood parody with Jim C. Hines and appeared in various publications including Realms of Fantasy and Every Day Fiction. Judging from "Dragon Dreams," I suspect we will be hearing much more from him in the near future. Daily Science Fiction is a new site that publishes a story every weekday, at professional rates, and has already featured work by such excellent authors as Mary Robinette Kowal, David D. Levine, Tim Pratt, Cat Rambo, Lavie Tidhar, and Greg van Eekhout. Most but not all of Daily SF's stories are flash fiction (their pattern seems to be to publish longer pieces on Friday), so I'm not their ideal reader, but they got me with "Dragon Dreams." 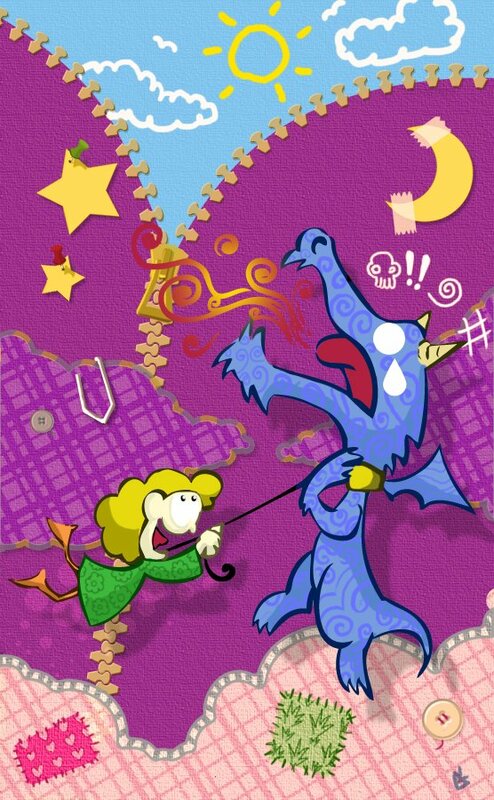 I highly recommend "Dragon Dreams," and since it won't take you but two minutes to read, what possible excuse can you have for not checking it out? The recommended story of the week is "When I'm Armouring My Belly" by Gemma Files, from the Edge anthology evolve, edited by Nancy Kilpatrick. The glut of vampire fiction in the past several years has left vampires too commonplace, too familiar. In evolve, Nancy Kilpatrick has recaptured some of the strangeness of vampires by asking her contributors to imagine the next step in vampire evolution. As a result, the stories in evolve are less predictable than most vampire tales——you never know just what sort of creature will emerge. 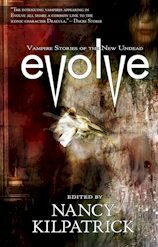 The authors in evolve are all Canadian and few are well-known (notable exceptions include Kelley Armstrong and Tanya Huff), but the stories are nearly all well-written, and I recommend the book to anyone looking for vampire fiction with a twist. That's why my favorite story in evolve is "When I'm Armouring My Belly" by Gemma Files. This is a horror story, profoundly disturbing right from the opening line ("Much later, he would recall the exact moment when he finally forgot his own name") and the initial scene of sexual abuse ("Her insides milking him hard enough to bruise all the while, wet and tight and numbing-cold as a close-packed box of snow"). This unpleasant eroticism is far more interesting than anything we get from most of the current crop of dashing, romantic vampires. For reasons that gradually become apparent, the protagonist of "When I'm Armouring My Belly" has a strange affinity with vampires. He is drawn to vampires and tries to aid them, even though he receives little in return but abuse and contempt. The tables eventually turn, but Files leaves it ambiguous whether the story's outcome is anything to celebrate. Gemma Files has a knack for unsettling fiction. She is the co-author with husband Stephen J. Barringer of the striking story "each thing i show you is a piece of my death," which was on my Hugo recommendations list last year, and she won an International Horror Guild Award for "The Emperor's Old Bones." 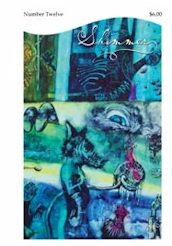 Her first novel A Book of Tongues, a weird Western, is just out from ChiZine Publications. My story recommendation of the week goes to "Near the Flame" by Erin Cashier, from the recently released Issue 12 of Shimmer magazine. This is the second SROTW to come from the pages of Shimmer, one of the best (and best looking) semiprozines in the market. Written in the style of an African folk tale, "Near the Flame" is the story of Nygibe (meaning "Near the Water"), later renamed Nygawa ("Near the Flame"), greatest of the Women of Agawa. The Women of Agawa possess the discrete but surprisingly powerful magical talent of telling a story with smoke. Nygawa is conflicted when the new king commands the Women of Agawa to use their magic to help conquer their land's neighbors. Wasn't this like the stories that she'd learned, the stories that she'd told? Weren't there always battles, and didn't battles always have a losing side? But those stories had just been stories, smoke high in the sky and whispers on the wind. This was life, red and real. As the fighting went on, as they walked south and south and south, whipping the fire before them like a beast, Nygawa realized that just like stories, battles needed ends. "Near the Flame" is a memorable tale featuring a powerful narrative voice. Erin Cashier is a subtle author, yet the nuances of her writing never distract from the story (a complaint I occasionally have with Shimmer fiction, some of which employs literary techniques too self-consciously). I am delighted to say Cashier is a fellow winner of the Writers of the Future contest. Among other places, her stories have appeared in Beneath Ceaseless Skies, Abyss & Apex, Writers of the Future, Vol. XXIV, and Footprints, with another forthcoming in InterGalactic Medicine Show. Shimmer is a great place to find up-and-coming writers, and Erin Cashier is definitely one to watch.